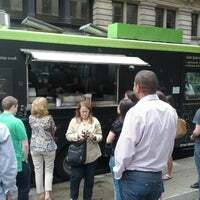 There's usually a line for lunch, but it's worth it. 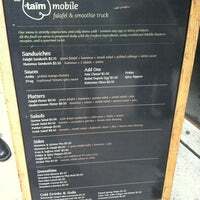 The falafel sandwich ("with everything") is outstanding, with a very interesting mix of flavors. If they're in your area (check twitter), just go! 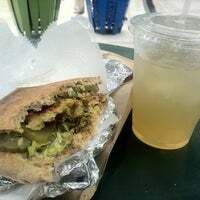 Get the falafel sandwich "with everything" (if you like pickles, and you better like pickles) and a ginger-mint lemonade. Lunch perfection. 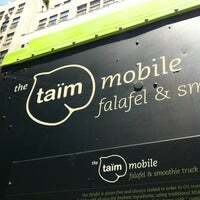 Delicious falafels and arguably the city's best hummus. Get a falafel on whole wheat pita with one of their signature smoothies to wash it down. You can't really go wrong with anything on the menu, but the flavor-to-nutrition ratio of the Quinoa Salad is amazing. the falafel sandwich is the best. the falafel are like pudding. 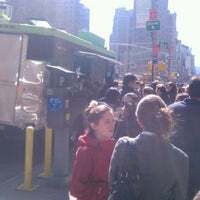 other placeCouldn't get a sabich sandwich, so was disappointed about that. The dates in the banana/date/lime smoothie get caught in the straw. It's great nonetheless. Perhaps the most delicious (and substantial) falafel sandwich ever!! The pickled cabbage rounds this out for perfect flavor and texture! 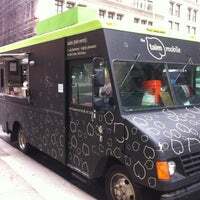 N-Sider Favorite: I don't know how in the world they make their scrumptious falafel but it's good enough to camp out over night for!!! 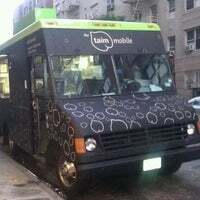 Winner of Best Falafel in the Village Voice 2011 Best Of issue! They pack the tiny fried balls with fresh herbs, giving them exceptional flavor. the cabbage salad is very tasty and i may be addicted to their falafel. the smoothies are also very tasty! On Wednesdays get the Harissa falafel sandwich with everything, because what else are you doing with your life? For $5.75, the falafal sandwich is the best best deal. It's huge and taste so good. 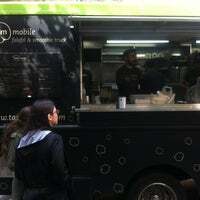 The food truck of our favorite falafel in the city. At $5.75 for a falafel sandwich is a bit steep, but it sure taste different than your average falafel spot, and one sandwich is surprisingly filling. 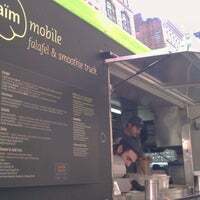 One of the best falafel sandwiches I've ever had. 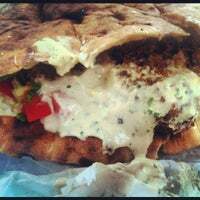 Definitely add the hot sauce to your pita! Fantastic and well worth the wait! Def get the brown sugar lemonade on a hot summer day!! everything is really delicious! The green hot sauce is kind of lifechanging. $7 for such an amazing falafel sandwich. Absolutely delicious and line moves pretty quick. If you want an extra kick, add the spicy peppers to your sandwich! Come after 2 p.m. to avoid a long wait. The falafel sandwich is worth it. Very reasonable prices - get the spicy falafel! 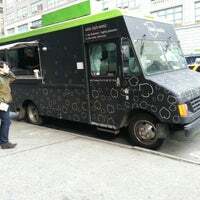 Readers' Poll winner of The Village Voice Best of NYC 2012 Best Falafel! Incredible food. Smoothies are okay, not the best. But the food is immense, get the daily special, it never disappoints. 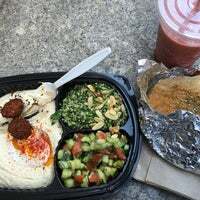 Get the Falafel Platter with a Fresh Ginger Mint Lemonade. Mmm! The Pear, Mint and Lemon Smoothie is amazing! Hey, don't be a fool. Get the Harissa falafel if they have it. Get whatever their special falafel is...always a winner! Genuinely the best falafel I've had in my life. Get the Harissa falafel if they have it! Fantastic falafel and a better bargain than Crisp. 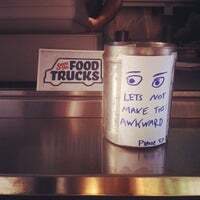 the friendliest truck in the city. the hot sauce is... hot. Definitely go for the harissa falafel and a smootie. Harissa falafel pita with mint lemonade. Awesome. If you're wearing a flowing dress or skirt, do not stand on the sidewalk grates while ordering. 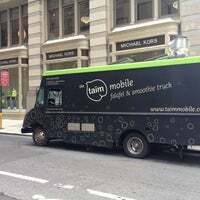 Taim's famous falafel and fresh fruit smoothies roaming the streets of NYC on wheels! Vegan and gluten free options, and don't forget, we're kosher. "Advantage: Large selection of organic and biodynamic wines and a handful of wines from local estates and seasonally inspired, locally sourced cuisine. For Dinner Taste: Porcini Farrotto"
"Yummy summer goodness! Try the guiness ice cream between two smores cookies. 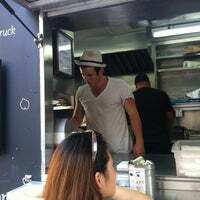 $6 for an icecream sandwich but worth every penny." "The Bacon Cheeseburger comes off the griddle quickly, thanks to the thin, diner-style patty, and is topped with a delicious bacon and American cheese combo." "This is a great place to hang out. The changing artwork in the main lawn is fun to see as well. It's a good place to go with a book and relax for a while, and often gets some light breezes through." "Spinach feta wraps in the morning are good. Nice selection of teas and great vanilla late"